AKG’s C5 stage vocal mic was already a class act — and now they’ve topped it! I’ve been a regular user and admirer of AKG stage vocal mics for some years and, over many live-sound gigs, my collection of D5 and C5 models has been deployed more than any other make and model in my inventory. Perhaps more than anything else, performers seem to like them — for both their audio and ergonomic qualities. The latest model in the line is the recently released C7, a stage vocal capacitor mic which is said to be capable of delivering premium studio quality together with the ability to handle high sound pressure levels and exhibit excellent feedback rejection, all wrapped up in a rugged and stylish body design. If this sound like the ideal vocal mic, add in the affordable price point and it becomes even more interesting. I was able to have a look at the C7 for a while at the end of the Summer, and managed to introduce it into a couple of live gigs and studio sessions to see how much we liked it. But first of all, let’s cover the technical stuff. 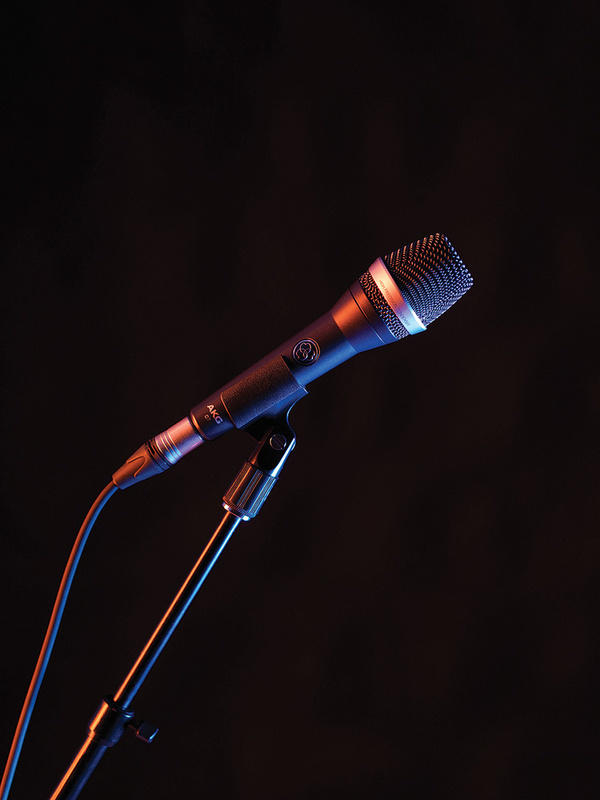 The C7 is a handheld capacitor microphone designed and marketed for vocal use in both live and recording applications. The heart of any mic is its capsule, and the C7 boasts an all-new, supercardioid 0.75-inch back-electret design, which the manufacturers call ‘open-space’. This term refers to the cavity directly behind the diaphragm/backplate assembly, which features large open ports, giving relatively unrestricted access to a resonance-free space beneath the backplate and contributing to the overall tuning and directional properties of the mic. If you unscrew the basket and look at the capsule, the three large ports are easily visible, and are very close behind the backplate compared to the C5 design. The published figures state a frequency response that spans 20Hz to 20kHz; looking at the chart the response is pretty flat from just south of 200Hz upwards, with a gentle lift around 3-4 kHz and a slightly more pronounced rise up to 5dB centred on 10kHz. The low-frequency response curves away smoothly to a -10dB point at 80Hz and continues to fall more steeply below that, to account for the desired low handling noise and tightly controlled sound needed for live stages. Impedance is a standard (nominal, and not more than) 600Ω and the phantom power requirement is 44 to 52 Volts. The C7’s sensitivity figure is exactly the same as that of the cardioid C5 capacitor mic, and it has slightly better equivalent noise and signal-to-noise specs in comparison. Of particular interest to live-sound practitioners will be the maximum SPL-handling capability of 150dB for one percent THD, which basically means it can handle loud stuff, close up. I have often found that, provided a handheld mic sounds good enough for the job in hand, it’s the look and feel of the thing which influences performers’ first impressions. A vocal mic is part of the overall performance, and they have to feel comfortable actually holding it or putting their faces behind it. As I said earlier, I use the D5 and C5 mics across all kinds of live gigs, and singers just seem to like them. The C7 looks almost identical to the D5, D7 and C5 versions and feels nicely balanced and very solidly made. It also fits perfectly into a standard-sized mic clip. The grille is steel mesh and is one of the toughest I’ve encountered, owing mainly to the thickness of the wire used and the pressed shape which adds rigidity; of course my mics get dropped occasionally but none of the AKG set has ever suffered any damage or deformity to the basket, unlike almost all of my round-headed mics. The sound of the C7 is fairly neutral, un-hyped and very controllable in a live mix. It’s one of those mics which gives you all the basic qualities of a good vocal capacitor — smoothness, detail, nice open and unrestricted top end, and so on — but like good studio mics, it provides a great platform to dial in as much excitement and character as you like. The low frequencies are tightly controlled and the C7 sounds very different from the cardioid C5, which I like to use on female vocals and acoustic guitars. I very much liked the C7 on both male and female voices, but when I tried miking instruments I also found that I have a new favourite horn mic — these are great on brass! The supercardioid pickup pattern is nice and sharp and exactly what’s needed on a busy stage, and the C7 does a good job of resisting feedback — I didn’t have any feedback issues at all in live use, and I had to point it directly into a monitor to induce problems. 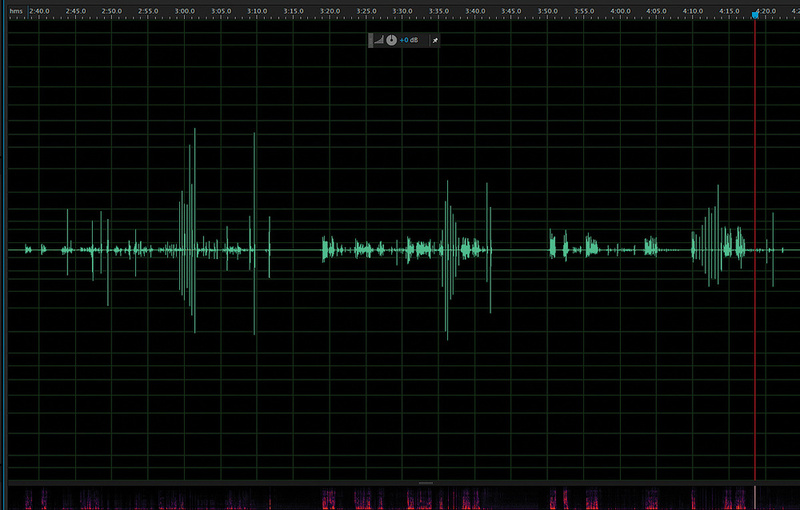 The low handling noise and resistance to vocal popping are also very impressive. The business end of this mic has three layers of protection: the steel basket itself, a fairly thick foam lining, and an additional mesh screen on the capsule openings. The capsule assembly is held in place by a soft rubbery membrane which AKG describe as mechano-pneumatic; the suspension material is similar to that used in the C5 model and the capsule is allowed a generous amount of movement within the basket, so should cope well with even pretty severe shocks. 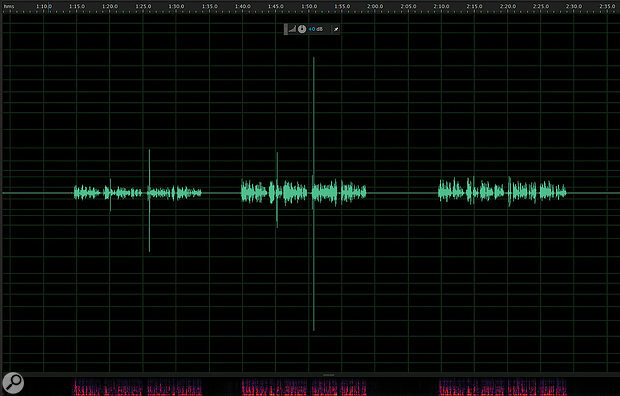 I did a quick test for close-up plosives and handling noise, comparing the C7 with my own C5 (with presence boost fitted) and D5 mics. 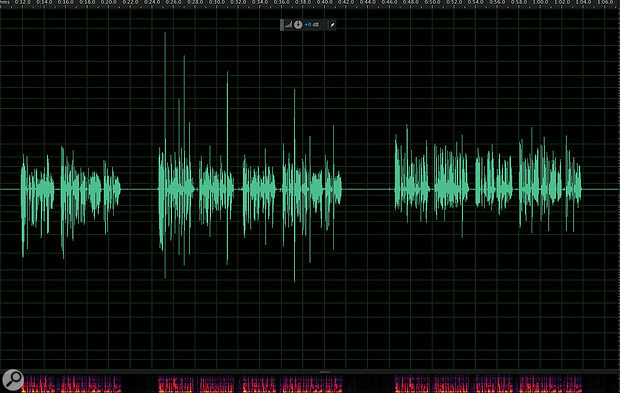 The online version of this article shows screenshots of the raw waveforms I recorded: firstly very close on-axis speech right up against the mesh, secondly around 10 inches away on-axis, and thirdly a handling noise comparison which involved passing the mic from hand to hand a few times, tapping my finger on the body, clapping with the mic in one hand, and finally setting it down on a hard surface. 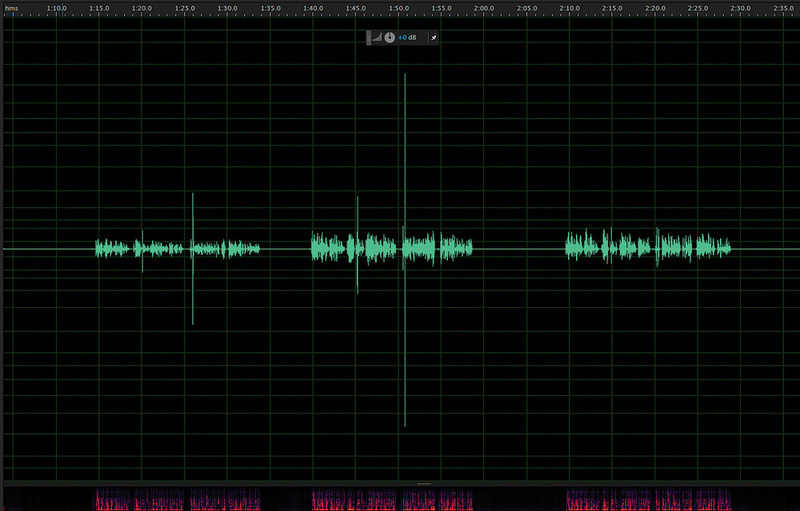 These tests were admittedly unscientific, but you can clearly see that the C7 resists popping very well, and its handling noise is visibly lower — and that’s compared to two mics I’ve never had problems with anyway. 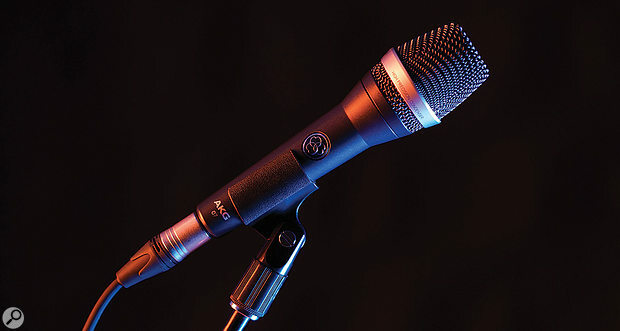 The AKG C7 is first and foremost a live stage vocal mic, and designing such a beast brings with it all kinds of compromises where the need for reliability, strong build, ease of use and resistance to feedback and popping are all potential areas where a trade-off in audio quality may be necessary. My impression of the C7 is that very little trading-off has been done in this case, and the ‘studio capacitor’ sound is available right there on a live stage. Of course, mic performance is very much a matter of personal preference, but I think the C7 is well worth a try for any live sound application and, at a current street price of around £200$250, it’s a potential must-have. Until a few years ago, handheld mics were almost exclusively of the dynamic variety, but there are now a number of capacitor models, from all the usual suspects including Sontronics, Shure, Sennheiser, DPA, Rode, Lewitt and more. 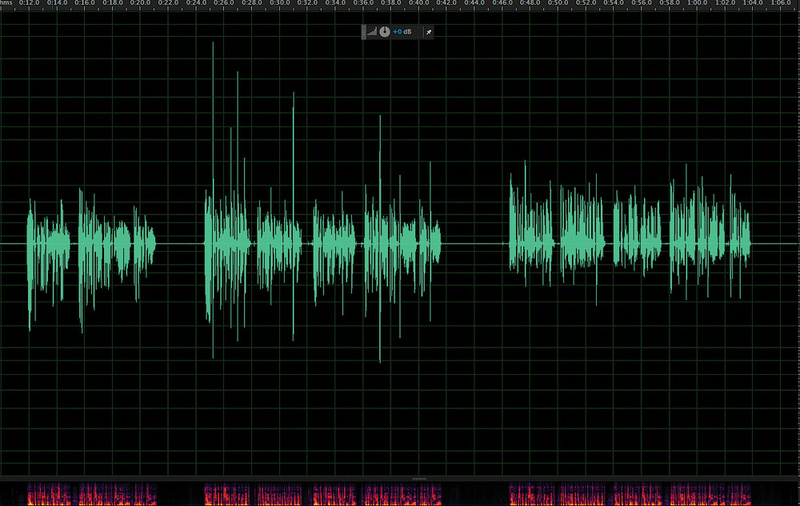 The three segments in each screenshot are recorded first on an AKG D5, then on an AKG C5, and the third is on the AKG C7. 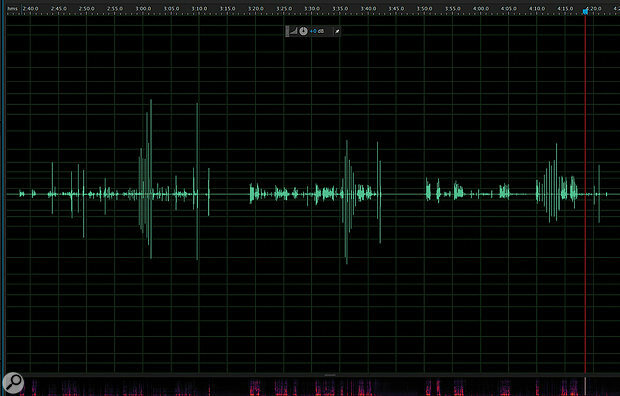 Screen 1 is a quick vocal test, recorded on-axis about an inch away from the grille. Screen 2 is the same source, still on-axis, but around 12 inches away. Screen 3 is a handling-noise test — each mic is being swapped from left to right hand and back again a couple of times, then tapped, then held whilst clapping, and finally being set down on a hard but carpeted surface. They are simply meant to illustrate the effectiveness of the pop filtering and capsule isolation in the C7. A step up from the (already good) C5, the AKG C7 is everything you could want from a stage vocal mic, and it’s affordable to boot!